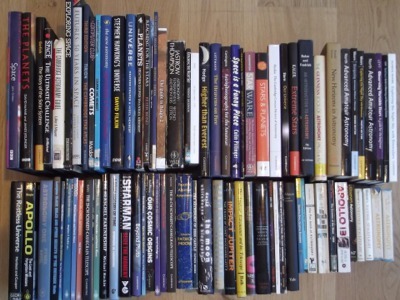 When the Club’s founding member Gordon Carter passed away in May, his family asked if anyone associated with the Club would like his large collection of astronomy books. Gordon’s library was a fascinating mix of astronomical fact, fiction, biography and trivia, and some of the collection was distributed to his friends within the Club. However, a large number of books still remain (more than 80 – pictured above). After some discussion, we decided that they should be put to good use and kept as a Club Library. We have now catalogued all of the books and will create a web page on which Club members can find out what books are available to borrow. We hope Club members will make good use of this fantastic resource and Gordon’s memory will live on through his love of astronomy and books! By submitting a comment here you grant Papworth Astronomy Club a perpetual license to reproduce your words and name/web site in attribution. Inappropriate comments will be removed at admin's discretion. ©2019 Papworth Astronomy Club. Theme based on Blue Basic by Jamesy.